What do I Feed My 14-month Toddle? Now LO is 14 month old (young) :-). What solid food have we fed him so far? The photo on the left is one of regular dinner for my 14-month old. 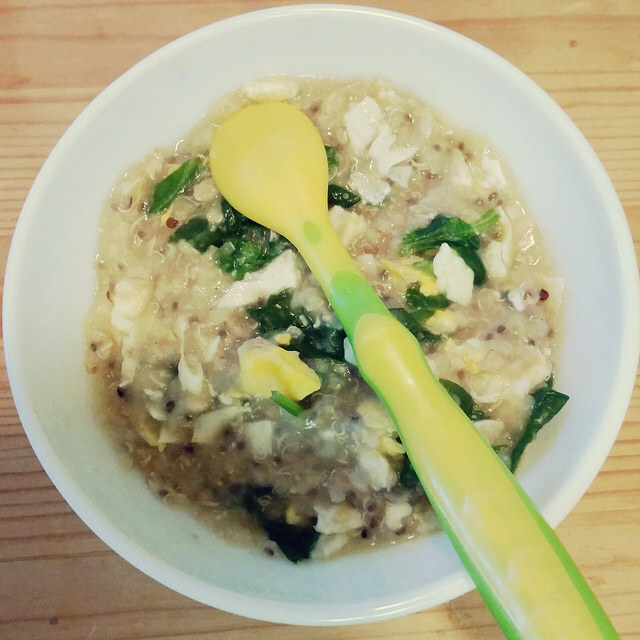 It has oat meal, quinoa, millet, amaranth, egg and spinach. My LO loves this type of combination! Again, if we have the choice, we always opt for organic food. It’s highly recommended to Avoid Genetically Modified Foods for Your Baby. Yes, it’s a little bit more expensive. However, since we are making baby foods at home, we save some money than buying those baby foods in jars. Our baby foods are made with loves and the best possible ingredients! What GM Foods are on the Canadian Market? What is Genetic Modification and Are GM Foods Saft to Eat? Copyright © 2019 New Mom Adventure. All rights reserved.